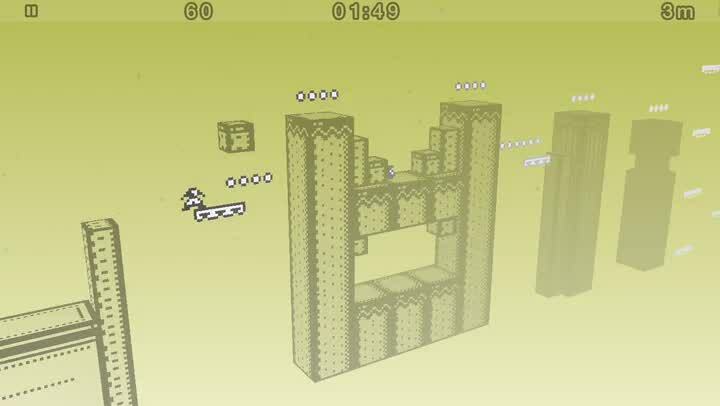 Remember that challenging retro platformer, 1-bit Ninja, that came out back in 2011? Well, Kode80 has brought it back with the brand new 1-bit Ninja Remix Rush ($1.99), which is now a procedurally generated race against the clock. I was born in the ’80s, so I grew up with platformer games in my childhood. I spent hours playing Super Mario Bros. and the like, even though it was always a challenge for me at the time. While I am not a pro at the classics, I always enjoyed them, and have a soft spot for them even now. So whenever I see a retro platformer in the App Store, I always have to check it out, and when 1-bit Ninja first came out, it was definitely one of my favorites at the time. So I was excited when I heard that the developer was coming out with a follow-up to the original, and it’s just as challenging as the first. If you’re a fan of stylized retro platformer games, then this is one you don’t want to miss out on. 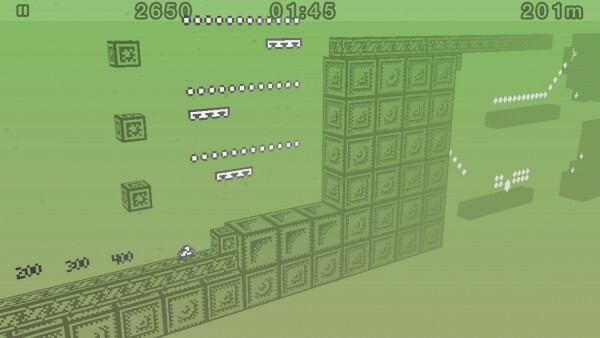 The visuals in 1-bit Ninja Remix Rush are beautiful, and serve as a fantastic homage to the classic games of yesteryear. Just like the original, it’s a creative blend of 2-D and 3-D perspectives, with grayscale 8-bit style pixelated graphics on top of soothing color backgrounds. While this sounds a bit confusing, it makes sense when you see it in action. The animations in the game are buttery smooth, which is great considering the nature of the game. And just as you’d expect from such a vintage game, the chiptune soundtrack and sound effects are fun and quirky. Unlike the original, there aren’t any actual levels in Remix Rush. Instead, you will be given two minutes to get as far as you can in a randomly generated stage while racking up the coins and points. And since the game will always create a new randomized stage, you’ll never get the same experience twice. 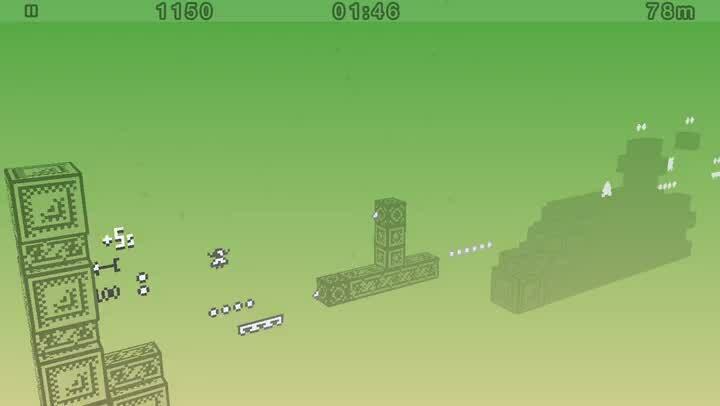 The stages will be filled with platforms, obstacles, enemies, and coins for you to collect. You can jump on top of enemies to kill them, but don’t run into them or other hazards because you only have one life. Your final score is determined by how long you survived, your distance, enemies killed, and coins collected. You can also collect clock bits to add precious moments to the clock. 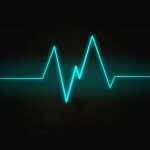 The controls in Remix Rush are intuitive and precise, just like the original game. 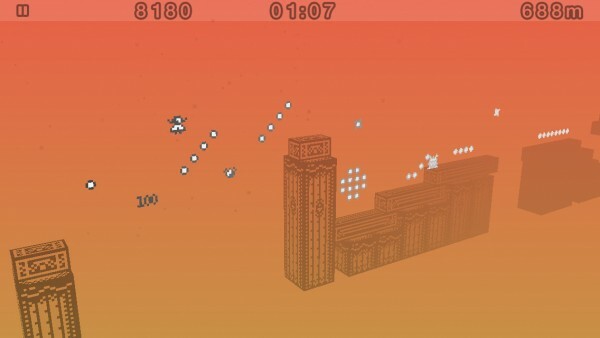 If you aren’t familiar, 1-bit Ninja only allowed players to move forward, not backward. If you needed to go back, you’d have to find some kind of spring or platform that turned you around. Remix Rush carries that same control scheme — just tap and hold the bottom left to move forward, and tap the right side to jump. While this may lead to some frustration among players, it’s part of the charm that makes 1-bit Ninja so challenging. 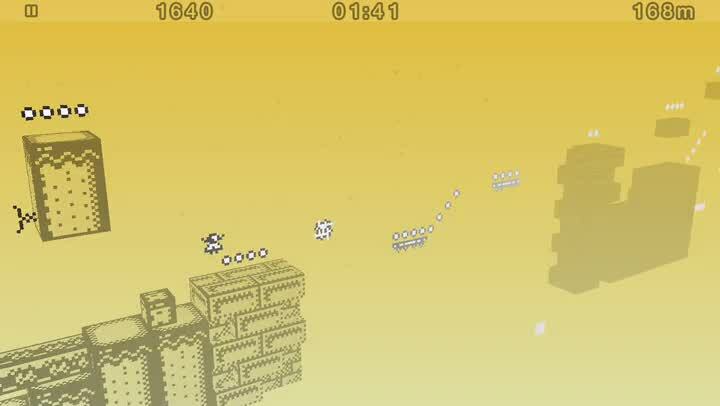 Like other endless runners and speed platformer games out there, 1-bit Ninja Remix Rush is perfect for some friendly competition. There is full Game Center integration for leaderboards (score and distance), but no achievements to obtain. 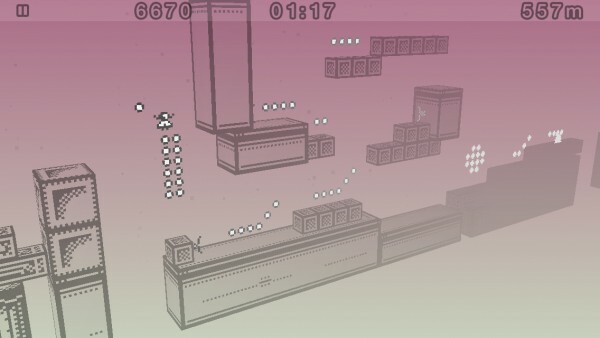 I’m always up for a challenge, and 1-bit Ninja Remix Rush provides just that. 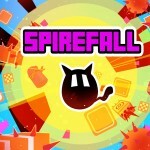 The graphics are the perfect mix of classic and modern, the music is delightful, the controls are intuitive, and the game is challenging but fun. If you’re a fan of the original 1-bit Ninja, or just love a good platformer game, then you need to check out 1-bit Ninja Remix Rush. It’s available on the App Store as a universal download for $1.99.